Printing can be done a number of ways, all using different methods to achieve the best results, but what type of printing are you using and what’s the best for you? Digital Printing can be done a number of ways. All digital printing is done by digital; files such as PDF’s, JPEG’s etc being sent to the printer. Many methods try to recreate other methods (mentioned below). There are inkjet, laser, toner & magnetic digital printers. In inkjet, the ink cartridge holds ink (as a liquid) and releases it through tiny sprays onto the paper beneath. the image it creates is actually made of small dots that, when viewed without a magnifying glass appear whole. 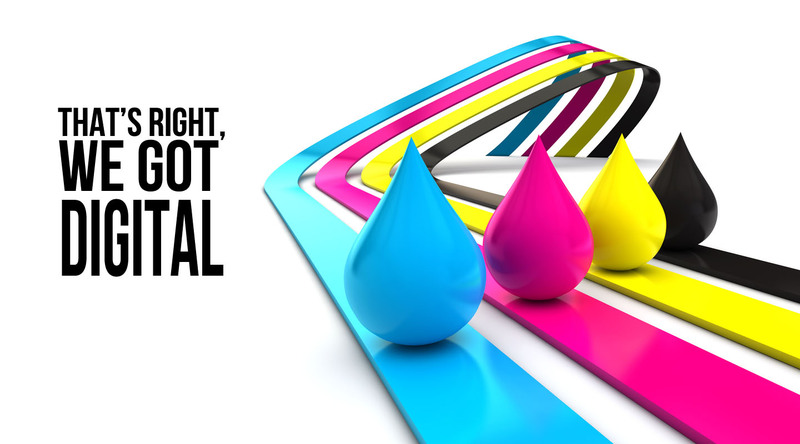 Laser & Toner printers use a different method, they change the electrical charge of the paper so that it is able to attract toner of CMYK (cyan, magenta, yellow and black) colours. The paper is usually then run through a fuser which melts the toner to the paper and creates your image. Magnetic printers work in much the same way except they don’t change the electronic charges, they change the magnetic ones. Still a common method of printing. It is often used on all the ‘odd materials’. Solid letters on plastics, writing on t-shirts and clothing, signs and others use screen printing. This method uses a screened material such a silk or nylon and stretches it out across a frame, fastening it in place. A stencil, usually cut by hand is then placed over the screen in order to block out all ‘non-printing’ sections. Ink (Usually rubber based) is placed inside the frame and scrapped across the material with a squeegee. The ink then goes through the screen and onto the material in the places that aren’t blocked out. Traditionally used to print things like labels, such as the ones you find on your drinks bottles. Mainly used within the packaging industry, the idea behind flexography is similar to Letterpress where it uses a stamp, but this one uses rubber etched with tiny grooves that pick up ink. The rubber stamp (plate) is wrapped around a cylinder which rotates and picks up ink from a reservoir then presses it into the printing material. The printing material usually being plastic, tissue, labels, stickers and cardboard etc. This method is usually used for printing long runs of things like magazines. Similar to Flexography, gravure printing has a rubber cylinder that picks up ink in tiny etched grooves and places it onto the paper. The only difference is gravure doesn’t use a rubber plate, the grooves are etched directly into the cylinder allowing it to last longer before wearing away and needing to be replaced. The first press ever created was a letterpress. It’s basically a stamp dipped into ink and stamped onto the paper (or other material(s)). A typewriter does the same thing letter by letter rather than the whole page in one press. This required each page to be setup before by hand and manually placing the letter stamps in place. As time passed, full page stamps were introduced to make the process easier (though still inefficient compared to other methods). However, the letterpress soon became too expensive and an inefficient way of printing and is rarely used anymore. One of the most common methods of printing in the world today (and also one of the oldest still in use). Offset Lithography works on the idea that water and oil (ink) do NOT mix. Using metal sheets (referred to as plates), image and non-image areas were burned onto the plates using light to expose the non-image areas. The plate was then attached to the cylinder much like in other printing methods. It then rotates and picks up water adding the water to the non-image areas, then picks up the ink (water and oil don’t mix) which is only transferred to the image areas and not the watered non-image areas. The plate then comes into contact with a rubber sheet (blanket) and the image is transferred over. The rubber sheet (blanket) then rotates and presses against paper, the image is transferred again. This is where the term ‘Offset’ comes from. You now understand the methods of printing but what about if you’re thinking of getting a new printer and want to know which printer is best? Well then check our infographic << it’s a useful guide to explaining the difference between each type of printer and which is best!